Ian qualified from Glasgow University Veterinary School in 1976 and moved to Northern Ireland shortly after. He joined the Earlswood team in 1980 and always had a keen interest in ophthalmology. He achieved his Certificate in Veterinary Ophthalmology in 1984. 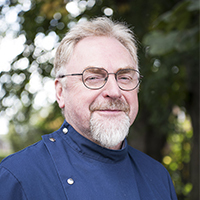 With 30 years of experience and study of ophthalmology, Ian has gained considerable clinical knowledge and surgical technique in complex cases. A lot of this is in Intraocular surgery and that unforgiving area of cataract removal. Having experienced the early days of simple techniques, he finds the state of the art equipment now used a joy to work with. well up to date with current thought. As an eye panellist for the British Veterinary Association since 1985 he believes that identification of inherited eye disease under BVA/KC/ISDS health schemes in breeding dogs to be paramount. He runs an additional monthly eye clinic at Brook Veterinary Clinic in Enniskillen to encourage these examinations and to provide local access to ophthalmology in the west.